During the Christmas period of 1923-4, Rudolf Steiner refounded the Anthroposophical Society at its headquarters in Dornach, Switzerland. This important event, which has come to be known as the Christmas Conference, can be studied on many levels, and its many mysteries have been central to Sergei O. Prokofieff's anthroposophical research over the years. His beginning point has been an enduring question: What did Rudolf Steiner mean when he called the Christmas Conference the "start of a World-Turning-point of Time"? In this far-reaching work, the author - working from several different viewpoints - guides the reader towards an answer. Prokofieff suggests that the impulse of the Christmas Conference can only be reenlivened today through conscious action by individuals to experience its spiritual essence. Rather than offering dogmatic conclusions, he opens up paths of approaching this goal by throwing light on different aspects of the Conference and what lies at its heart: the Foundation Stone and its Meditation. 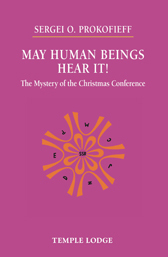 In particular, Prokofieff explores three key perspectives: the connection of the Christmas Conference with humanity's evolution; the inner relationship of each individual anthroposophist to the Christmas Conference; and the significance of the Conference to Rudolf Steiner himself. Although this is major work of some length, the individual chapters of May Human Beings Hear It! are complete in themselves, and can therefore be studied independently of each other.